Photo credit: Adapted by WhoWhatWhy from CIA / Wikimedia and National Archives. The National Archives and Records Administration (NARA) just released the largest number of JFK assassination files it has released thus far this year — 13,213 mostly CIA files — but then introduced a frustrating wrinkle, raising doubts about the coherence of the process and about their intent. Upon brief inspection, it appears that all of the files so far examined still contain redactions. If the files have not been re-reviewed yet by either the specific agencies (such as the CIA, FBI, and NSA) or the National Archives themselves, then one wonders why they would release them now in their present redacted form. It’s Alice in Wonderland time. Only four of the files are classified as fully-withheld, meaning that the public had never seen them before. Two of the files are from the NSA, and two are from the CIA. 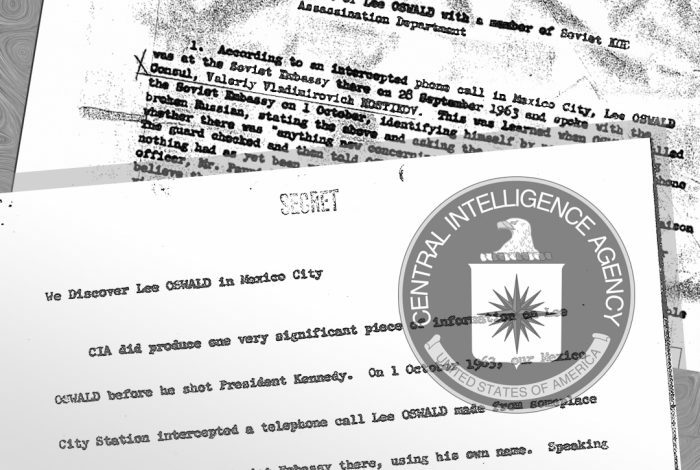 One of the CIA files, written entirely in Spanish, is labeled “Actividades De ‘LEE HARVEY OSWALD’, EN MEXICO” (Activities of Lee Harvey Oswald in Mexico) and originates from the Mexican Direccion Federal de Seguridad (their intelligence service). A full 48 out of 52 pages are completely redacted.